Expert tip: This is one of the most popular yoga retreats offered in India. This yoga retreat by Yoga Vidya Mandiram Yoga School is a unique and powerful program to experience deep relaxation, healing, and transformation through both traditional and modern form of asana and pranayama practices, yoga Nidra, yogic cleansing processes, and many contemporary meditation practices. At the same time, the aspirants will have opportunity to explore the Himalayas shrines and temple. The accommodation is facilitated with air-conditioning, and Wi-Fi connection. However, please note that Yoga Vidya Mandiram School provides the accommodation for a student who joins yoga classes. Any friends or relatives will not be included in the accommodation. There are two room options available for this course: a single private room and double shared room. The rooms are equipped with double beds, air-conditioning, and Wi-Fi connection. All rooms are shared with the same gender. Mother and daughter, wife and husband can share their rooms. The bathrooms are equipped with hot showers and towels. Yoga Vidya Mandiram Yoga School is a registered yoga school centered in Rishikesh, India. The center is dedicated to restore, explore and impart the purest form of knowledge of yogic studies and its practices with their scientific verification. It intends to maintain the yogic teachings to their ancient and traditional purity as taught by the yogis of the Himalayan masters. Thus it is a bridge between pure and traditional form to contemporary format of teaching yoga. Yoga is a science and art of living blissfully. Knowingly or unknowingly, you are continuously looking for the solution of body, mind, and soul issues. 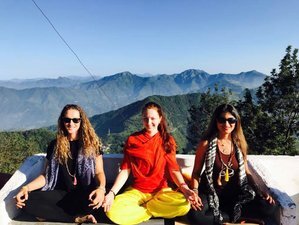 Yoga retreat at Yoga Vidya Mandiram provides a solid platform to explore the yogic spiritual roots in the Himalayas through yogic practices along with visiting shrines, temples, and ashrams. Yoga Vidya Mandiram guides its students of yoga to a journey of self-discovery and inspires to practice yoga holistically. Yoga is a process of integrating the body, breath, and the mind and focus are placed on other limbs of the practice beyond the physical yoga asanas. Schedule is subject to changes without prior notice. Please note that the first day of the retreat will start with an opening fire ceremony at 10.30 a.m. Yoga Vidya Mandiram advises that you arrive at least 1-2 hours early to settle into your room and take your time before the retreat starts. Swami Omkarananda grew up around the great lady saint of India, Ma Anandamayi. He studied and lived with six enlightened masters: Swami Dayananda Saraswati, Swami Veda Bharati, Swami Chidananda Saraswati, Dalai Lama, Lung Chu, and the master of masters, Kalyan Babaji of Himalayas. Academically, Swami Omkarananda holds a degree in Electronic Engineering, along with five master's degrees and a Ph.D. in Metaphysics. A seeker of truth with an engineering background, Swamiji correlates science with ancient wisdom to create and inspire applied spirituality and transformation in everyday lives. Swami Atma Jnanananda Giri is a sadhaka from Swami Rama Sadhaka Grama, Rishikesh, who by profession is a homeopathic doctor. He learned meditation techniques from his guide and teacher, Swami Veda Bharatiji. Now, he delivers his lectures and classes on meditation, mantra chanting, Nidra yoga, and philosophical texts such as Bhagavad-gita and Patanjali Yoga-sutras. According to Swami Atma, 'finding happiness and peace within oneself is the greatest achievement in life'. Yogacharya Sandeep Pandey was born in a traditional Brahamna Family and was sent to Gurukul at the age of 8. At the Gurukul he studied the Yajurveda and mastered all the 16 Samskaras along with Yogasana, Pranayama, Shat Kriyas etc. He participated in many National level Yoga championship in India and won prizes. However, his quest for knowing the inner self through yoga lead him to Swami Rama Sadhaka Grama where under the direct guidance of H.H. Swami Veda Bharati, he studied and practiced the deeper and subtler aspect of Raja Yoga. Yogacharya Lalitji is a qualified experienced Hatha-Yoga and Pranayama instructor at Yoga Vidya Mandiram. He was born in the spiritual family in Yamuna Nagar, Haryana. He began his yoga journey in the lap of the Himalayan yogi Swami Veda Bharatiji who initiated him into the path of Yoga and Meditation. In his academic education, he holds his E-RYT 200 and 500 RYT from Yoga Alliance, USA. He brings sincere love for students in his classes he holds. He sees yoga a way of inspiring lives and a meaning of discovering one’s self. He keeps looking for new opportunities to enhance his knowledge. Priya Poojaji is a qualified experienced yoga anatomy and physiology instructor at Yoga Vidya Mandiram. She was born in the spiritual family of Swami Rama of the Himalayas. She began her yoga journey in the lap of the Himalayan yogis since her early age. Her spiritual master, Swami Veda Bharatiji initiated her into the path of Yoga and Meditation when she was 15 years old. Since then she has been untiredly dedicated herself to the learning of yogic knowledge and it’s different sciences, yoga anatomy and physiology. She holds her E-RYT 200 and 500 RYT from Yoga Alliance, USA. This yoga and meditation retreat will be held at Yoga Vidya Mandiram Yoga School, Rishikesh, India. The yoga school is located in the heart of the sacred township of Rishikesh, on the bank of the holy river Ganges and at the foothills of the Himalayas, the abode of yogis. The school is in a wonderful magical place, only a short walk from the main town and the bank of the river, and it is the perfect location for your activities. During this yoga training, you will be served daily three delicious and healthy vegetarian meals - breakfast, lunch, and dinners. Filtered water, herbal tea, and snacks are also available. The menu is creative and balanced with proteins so you feel full and satisfied. If you are planning to have fast in any day, please inform Yoga Vidya Mandiram for avoiding food waste. Please book your flight to arrive at Indira Gandhi International Airport (DEL), from where you can take a domestic flight to Jolly Grant Airport Dheradun (DED). Another option is to book your flight directly to arrive at Jolly Grant Airport (DED). Taxis are always available anywhere in India. The drive from Indira Gandhi International Airport (DEL) to Rishikesh will take around six hours depending on traffic conditions. Buses to Rishikesh leave New Delhi from the Kashmiri Gate national bus stand approximately every hour. The bus ride takes about eight hours and costs around 450 INR for air conditioned buses and 250 INR for buses without air conditioning. The best option is to reach Haridwar train station, about 45 minutes away from Rishikesh, by road on a driven taxi or the so called tuktuks. From Delhi, the train ride takes approximately eight hours, depending on the train. Haridwar is serviced by many trains from and to Delhi, Varanasi, Rajasthan, Amritsar, and many others. Airport: Jolly Grant Airport Airport transfer available: Jolly Grant Airport (US$15 per person) Additional charges may apply. You can request this in the next step. Airport: Indira Gandhi International Airport Airport transfer available: Indira Gandhi International Airport (US$75 per person) Additional charges may apply. You can request this in the next step. Yoga Vidya Mandiram is located in Rishikesh, Uttarakhand, India. They offer registered yoga teacher training programs (YTTP) affiliated with Yoga Alliance.